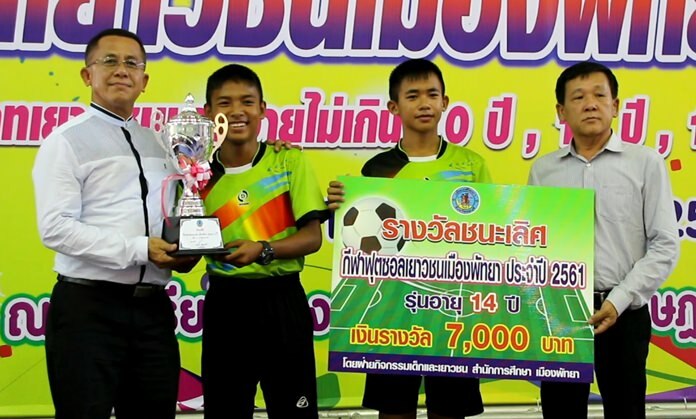 Players from Pattaya School No.1 receive their trophy and cash award after winning the under-14 category at the Pattaya futsal tournament, June 23. Pattaya children from ages 10 to 16 competed to find the best junior futsal teams in the city at a Pattaya School No. 2 tournament. The June 23 competition broke players into four age groups: Under 10, 11-12, 13-14, and 15-16. 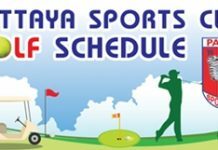 It was open to players across Chonburi Provinice. Wat Suthawat School won the under-10 bracket, Pattaya School No. 7 won the under-12 category while School No. 1 took both the under-14 and under-16 titles. First-place winners in each bracket received 7,000 baht and trophies. Awards were given to the kids by director of education, religion, culture, and sports division of Pattaya City, Nopsitcha Na Nakorn, and director of Pattaya City School no. 2, Pulsak Pongpipatwattana.